Jewish Humor Central: "Soon By You" Orthodox Singles Comedy Releases Third Episode - "The Shabbat Meal"
"Soon By You" Orthodox Singles Comedy Releases Third Episode - "The Shabbat Meal"
Back in May we posted the pilot episode of Soon By You, a new web comedy series that depicts the joys and challenges of Orthodox Jewish dating for young professional singles in New York City. In July we posted the second episode. Your reactions to the comedy were very positive, and so we have been watching for new episodes to show up. 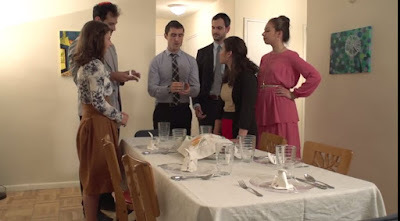 This week the third episode, The Shabbat Meal, was released, and we're sharing it with you today. In the pilot episode titled The Setup, a rabbinical student named David accepts a blind date at a restaurant in Manhattan’s Upper East Side. While there he accidentally sits down across from Sarah Feldman, a free-spirited artist with whom he instantly connects, but that's not his date. Through a series of different events he’s eventually led to the “right” girl, also named Sarah, a larger than life superficial-type character, who is so caught up with ordering food and herself to actually catch the nuances and humor of his excuses that led him to be late. This situation leads to a not-so-typical romantic encounter with David and Sarah F, who take short breaks from their respective dates to meet at the back of the restaurant, where they dream up mural ideas and finish each other’s sentences. It’s an example of a matchmakers' worst nightmare and how chemistry leads the way to a potential match. Get ready to cry, laugh, be amused, and, watch the "fun" filled life of Orthodox dating. In the second episode, The Follow Up, David loses Sarah F's phone number. With the help of his roommate, Z, he is willing to do anything to find her. Two new characters are introduced and we spend more time with the original four characters. In the third and latest episode, David goes to great lengths to see Sarah F again. Meanwhile Ben faces his first conflict between work and faith. Our guess is that we will be following these characters through a series of romantic adventures, that is if the filmmakers find sources of funds to continue producing the series. A Joke to Start the Week - "Good Genes"
A Joke to Start the Week - "Canine Career Choice"